Sunshine Seasons in The Land Pavilion is a food court that offers a variety of food stations – Soups and Salads, Sandwiches, The Grill, Asian and Grab n’ Go. At The Grill you'll find this grilled salmon topped with kalamata olive pesto sauce and served with green beans and roasted red russet potatoes. For a quick service entree I found it to be surprising good. The salmon was cooked just right, very moist and had a lot of flavor. 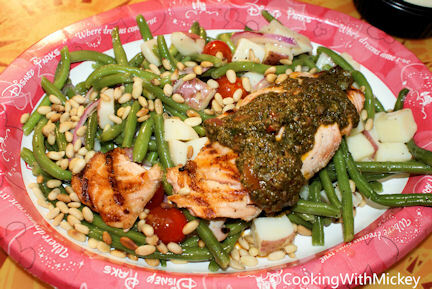 The green beans with roasted pine nuts complimented the dish nicely. On a hot and humid Florida day this is an excellent item for a light, refreshing lunch. It’s not heavy, so you don’t feel full when going back out into the exhausting heat. For those who like to share meals this is a good choice since it's a decent size portion. If you are at Sunshine Seasons and looking for something besides burgers, chicken tenders and other typical counter service fare, give the salmon a try. TIP: Before grabbing a bite to eat for lunch at Sunshine Seasons pick up a FastPass for Soarin’. If it’s early in the day, chances are good that by the time you are finished eating it will be time to ride Soarin’, and if not well then you have enough time to take a boat ride on Living with the Land.